Saturn wields the Silence Glaive, the ultimate weapon. If she ever lowers her Glaive to touch the ground, the world will end. She also has those cool laced-up boots and her frilly sleeves. A heart crystal-like ornament is both on her brooch and her choker. She also has her own unique earrings and her tiara is a different colour than her skirt. Saturn is arguably the most powerful senshi. She has the power to destroy the world and is the senshi of Death, Rebirth, and Silence. She defeated Pharaoh 90 with the help of Super Sailor Moon. She also, as Hotaru, fought a psychological battle between one of the Death Busters' most powerful enemies, Mistress 9 - and won. She also has healing powers, such as when she used them to heal Chibiusa's (Rini's) scrape on her knee when they first met. She is also one of the only senshi to have real powers out of uniform (ie. in human, not senshi, form). Hotaru has the prettiest eyes. Her big, round eyes are a deep purple and are highly reflective. No other senshi or character in Sailor Moon has eyes like her. She also has a soft, sweet voice and pale skin that accentuates her features. She has that great, shoulder-length black hair with the purple shine. 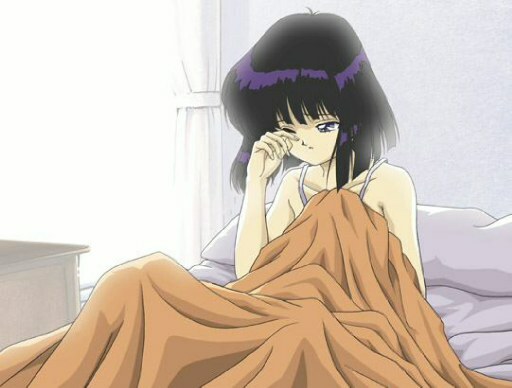 After Pharaoh 90 is defeated, Sailor Saturn is reborn. She comes back as a baby to restart her life. (She's also a really cute baby!) 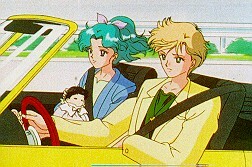 Baby Hotaru is taken into the care of Haruka (Amara), Michiru (Michelle), and Setsuna (Trista). In Sailor Moon Stars, she calls them "Haruka-papa", "Michiru-mama", and "Pluto-mama". Hotaru grows up very quickly compared to normal babies. After she is reborn, Hotaru stops wearing dark colours and starts to wear brighter colours, such as yellow and pink. This symbolizes her new beginning. However, she shows no signs of her healing powers after her rebirth. Sailor Saturn has the power to destroy the world, but in doing so, she must sacrifice her life. She refuses to use her powers until the last minute, because she does not want to risk the lives of her friends and family. But she is willing to risk her life for the ones she loves. Sailor Saturn lives each day with the knowledge that she can destroy the world. Her strength at carrying this burden is remarkable. She could easily end all the world's pain and suffering, but knows that although she has the power to do so, she does not have the right to decide to end the world. Tomoe Hotaru, when translated from Japanese, means "Firefly of Death", or "Firefly rising out of the earth." (Fireflies are associated with the dead in Japanese culture). She is, by the way, the only senshi to keep her real Japanese name in the English dub (with the correct spelling), although her last name is pronounced "toe-moe-eh" rather than "toe-moe" as in the English Dub version. Hotaru was very young when she lost her mother, but her father's love made up for that. 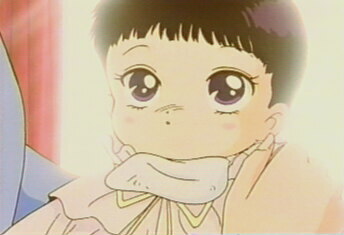 An only child (I think Sailor Moon's the only senshi to have a sibling), her father was very protective of her. When she died in an explosion at her father's lab, Professor Tomoe was devastated. In order to save her life, Professor Tomoe, agreed to become a slave of Pharaoh 90's. He sacrificed his body so that Hotaru could continue living. Even when he was possessed by Pharoah 90's power, he was still a kind father to Hotaru, comforting her when she felt like an outcast at her school. Also, when Uranus and Neptune finally rid Professor Tomoe of Pharoah 90's influence, he still tried to help Hotaru. Even when he was badly hurt, he cared only for Hotaru's well-being. He begged Sailor Moon to give him the Holy Grail (Purity Chalice), because he thought that it would ease Hotaru's pain. Besides, the main reason that Hotaru won the psychological battle against Mistress 9 was because she knew there were people she cared about who needed her help (mainly her father and Chibiusa). Later on, she is taken care of by the Outer Senshi (cool parents, ne?). The whole season of Sailormoon S was dedicated to stop the Sovereign of Silence (the Dark Messiah) from destroying the world. The Sovereign, of course, was Hotaru's alter-ego, Mistress 9. The outer senshi's mission was to destroy the Sovereign before she awakened. When Mistress 9 finally awoke, it was revealed that she was under Pharoah 90's influence. Mistress 9 was defeated by Sailor Saturn, but everyone was still afraid that she would destroy the Earth. Ironically, Sailor Saturn was the one who ended up saving it. Hotaru's dream is to become a nurse, so that she can help and comfort others in need. Her healing powers are used only to help others, Chibiusa (Rini) saw her sweet nature when Hotaru ran a long way to find Rini's hat, even though it was very hard for her to run long distances. The Inner Senshi also helped protect Hotaru from destruction by the Outer Senshi. Hotaru, at least in Sailormoon S, has a very weak and frail body. She could not run very far without being tired, and sometimes had "seizures". This was because Mistress 9 was inside her body, continually fighting her. However, despite her weak body, she has (arguably) the strongest magical powers. She is at least tied with Sailor Pluto for being the strongest senshi. Saturn has the power to destroy the world, but Pluto has the power to stop time. Pluto may have to power stop Saturn's attacks, but if Saturn did use her power to destroy the world, Pluto's powers would be useless. There is a lot of ambiguity surrounding this issue. Apparently, both senshi will die if they use their full power (like Sailor Moon). Hotaru is very human-like. By this I mean that she has both a dark side and a good side, much like many of us do. This makes her very easy to relate to. She faces struggles such as fitting in at school, losing her family, and finding friends when she is an outcast. She does not like everyone she meets (such as Kaolinite/Kaoli) but her ties with her friends are extremely strong (like with Chibiusa). 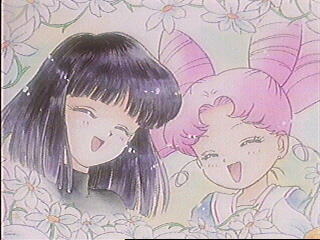 In fact, though it was Chibiusa's heart crystal that turned Hotaru into Mistress 9, it was Chibiusa's friendship that allowed Sailor Saturn to arise and defeat Mistress 9. Sailor Saturn also refused to let Sailor Moon stop her from destroying Pharoah 90, and thus lose her life. (I find this ironic, since Sailor Moon sacrifices her life all the time to save the world, but refuses to let anyone else do so). So that's why I love Sailor Saturn. Any comments, corrections, or additions, please send them to me at sailorsayonara@yahoo.com Arigatou!